You’d trust your best friend with your life…right? Natty has the perfect life, a successful business, two daughters she adores and her teenage sweetheart as a doting husband. While the stresses of work build there is nothing Natty can’t handle…apart from maybe her mother in law. That is until she receives a phone call that her daughter is desperately ill, her oldest friend steps in to help out but what Netty doesn’t know is that this could be the start of her world beginning to unravel. I will start out by saying that Daly’s novel is delicious and addictive.I give you fair warning, this book will keep you up until the early hours desperate to know what’s going to happen next. There was no part of me that wanted to put this novel down at any point of the day. Daly has an incredible talent for creating a world in which anything can happen and anyone can have secrets you’d never even consider. If there was anything I’d change about this novel it’s that I’d want it to continue. I want to know what happens after it ends because it was just so damn good. The protagonist, Natty, is a determined woman, she’s worked hard for all she has and has never had a reason not to trust her best friend, until now. There are twists, turns and ‘oh my god’ moments throughout the whole book. I also particularly liked her daughters, they grow as the book goes on and become incredible characters, in fact I would have liked to have known more about them. I was also pleased to see the return of Joanne, the policewoman (those of you who have read Just What Kind of Mother Are You? will remember her).I also found the character of Eve to be written in a breaktaking way. I hated her, but at the same time I couldn’t get enough. I’ll leave it there in fear of spoilers. 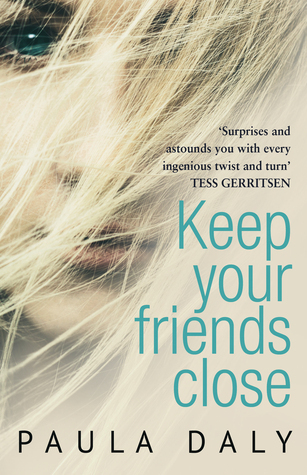 It’s hard to write a review for a novel such as this because I could easily drop in some spoilers without realising. Each twist and turn has been carefully thought out and although there are some clues throughout, there is still the ability to shock, especially in relation to Natty’s past…Daly’s one of those writers that once you’ve read one of her books you’re hooked and I can’t wait to get my hands on her latest novel this summer. I only have a few weeks to wait but I can assure you Keep Your Friends Close has wetted my appetite and I’m sure it will do the same for all of you. It should not come as surprise that I’m giving this novel five stars *****. It is written with a sharp mind and pure talent on Daly’s part. I read this book in less than a day, with other things to do. The thought will always be at the back of your mind too, who do I really know? This novel really is a must read, I promise you wont regret it. Daly’s new novel The Mistakes I Made is out on the 27th August.